The principles are based on the experiences of LIBER libraries in the past two years, and aim to guide libraries and consortia as they shift from a reader-pays model (subscription licensing) to an author-pays model based on Article Processing Charges (APC). Licensing and Open Access go Hand-in-Hand – The world of subscription deals and APC-deals are closely linked. Nobody should pay for subscriptions and pay APCs at the same time (‘double dipping’). Each new license agreed on should therefore contain conditions about both sides of the coin. Increased spending on APCs should result in proportionately lower spending on subscription fees. No Open Access, No Price Increase – There is enough money in the system already. Libraries have paid annual price increases of up to 8% for years, supposedly to allow publishers to innovate. A key feature of innovation for the research community is that research outputs are freely available. Therefore if an agreement with publishers on Open Access cannot be reached in our contracts, future price increases should not be accepted. Transparency for Licensing Deals: No Non-Disclosure – The practices of libraries should fully reflect their commitment to Open Access. Licensing agreements should therefore be openly available. Society will not accept confidential agreements paid for with public money in the form of non-disclosure agreements, as recent developments in Finland and The Netherlands have shown. 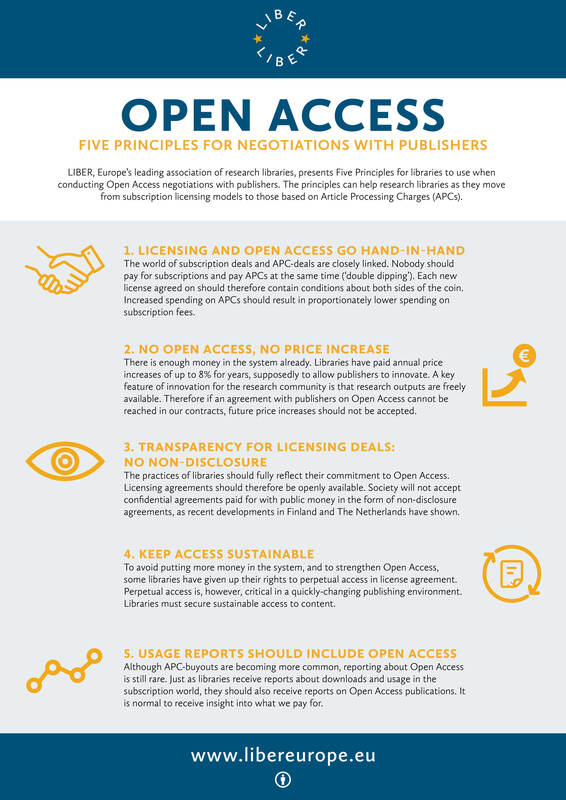 Keep Access Sustainable – To avoid putting more money in the system, and to strengthen Open Access, some libraries have given up their rights to perpetual access in license agreement. Perpetual access is, however, critical in a quickly-changing publishing environment. Libraries must secure sustainable access to content. Usage Reports Should Include Open Access – Although APC-buyouts are becoming more common, reporting about Open Access is still rare. Just as libraries receive reports about downloads and usage in the subscription world, they should also receive reports on Open Access publications. It is normal to receive insight into what we pay for. 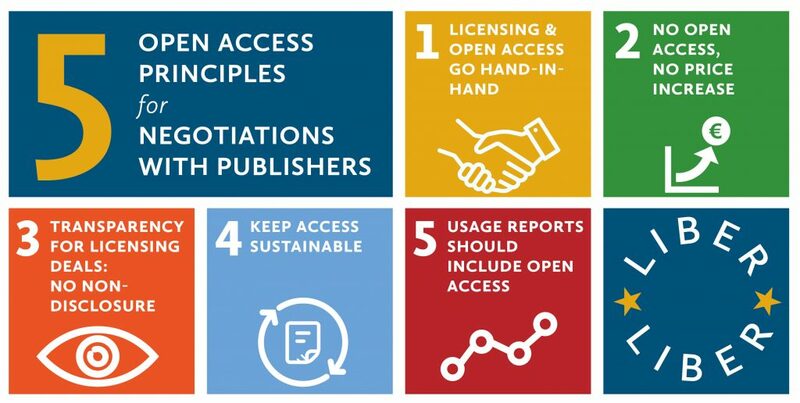 These Five Principles are part of LIBER’s ongoing commitment to facilitate knowledge exchange between its libraries, national governments and stakeholders. They are inspired by other statements including the Amsterdam Call for Action on Open Scienceand the OA2020 Initiative. Our Principles align with the recently issued Recommendations on Open Science Publishing from the Open Science Policy Platform (OSPP). The OSPP guidelines emphasize sustainability, transparency, incentives, research evaluation and community involvement. They also call for stakeholder communities, EU member states and the European Commission to jointly assess and identify how the Commission’s goal of full Open Access by 2020 should be achieved. Please contact LIBER President Kristiina Hormia-Poutanen or Matthijs van Otegem, co-chair of LIBER’s Open Access Working Group, with any questions about this statement. The full statement and accompanying poster can also be downloaded.